What Does Code B1302 Mean? OBD II fault code B1302 is almost universally defined as “Accessory Delay Relay Coil Circuit Failure”, and is set when the PCM (Powertrain Control Module), and/or the GEM (Generic Electronic Module) detects a failure of one or more circuits that control delayed access to system power by one or more accessories. In practical terms, most vehicles are equipped with accessories such as sunroofs, power windows, courtesy lights, dome lights, and others that are able to access vehicle system power for a set period of time after the ignition key is removed from the ignition lock. This feature allows drivers to close windows and sunroofs while the vehicle is switched off, but delayed power also allows for headlights and courtesy lights to remain switched on for set periods of time to allow drivers and passengers to find their way should they arrive at a destination in the dark. Moreover, on some applications, most notably VW products, the electrically operated radiator cooling fan is fed with delayed power to combat the effects of heat soak, which raises the coolant temperature significantly when a hot engine is switched off. Although design specifics vary somewhat between applications, the general operating principles of delayed power to accessories involve a controller known as the GEM (Generic Electronic Module) or sometimes the SJB (Smart Junction Box) that controls one or more relays based on the position of one more accessory control switches. Note that the GEM itself does not supply power to accessories; it only supplies power to relays that ultimately feed power to the accessory involved. In some cases, one relay can control more than one accessory circuit, in which case all accessory control switches and/or sensors on affected circuits is monitored. All inputs are communicated to other affected controllers via the CAN (Controller Area Network) and based on switch/sensor inputs and information received from other controllers, the GEM activates the relevant relay to feed power to the accessory circuit(s) controlled by that relay. For instance, based on inputs from the headlight switch and other sensors, such as an ambient light meter, the GEM will provide power to the headlight control circuit to keep the headlights on for a set period of time after the key is removed from the ignition lock. NOTE: GEM controllers are sensitive to input voltages, which is why they are protected by Field Effect Transistors. Therefore, great care must be taken when testing input circuits; do not use test lights inside fuse boxes. Use a proper circuit tester like the example shown below to prevent accidental short circuits and to remove all the guesswork that goes with using test lights. 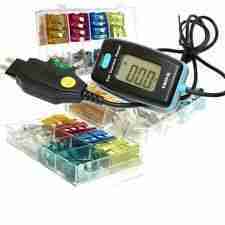 Note that the tester shown below plugs into the fuse holder, thus giving accurate results and readings. What are the common causes of code B1302? Excessive current draws from stock relays to power aftermarket electric radiator cooling fans. Connecting auxiliary driving lights to relays that are not designed to provide the additional load. Connecting after market audio systems to relays and circuits that cannot provide sufficient current to power amplifiers and powered speakers. Short circuits within harnesses caused by non-professional mechanics in efforts to diagnose electrical problems. NOTE: The few examples of possible causes due to modifications listed above can have serious and often unpredictable results that can immobilize a vehicle. Any modifications to the electrical system on any application should always be regarded as “red flags”, and the damage caused by modifications of whatever nature may require professional diagnosis and repair. What are the symptoms of code B1302? One or more power windows can stop working. Dome and courtesy lights may not work. Audio, navigation, and telephony systems may stop working. Head lights may no longer work when the vehicle is switched off. In cases where seats are automatically adjusted to allow for easier egress from the vehicle, these adjustments may no longer work. NOTE: Some Ford products, most notably Ranger and Explorer trucks are notorious for the frequency with which delayed power to accessories such as power windows fails. How do you troubleshoot code B1302? Most applications make use of FET (Field Effect Transistor) protection strategies to control and protect control modules against excessive current flows. Thus, when an excessive current flow or fault event such as a short circuit occurs, the GEM will interrupt either the current flow, or the ground circuit to protect the affected controller against the effects of the fault event. When a fault event occurs and power or ground is interrupted, the event is recorded as a fault code, and in most applications, the recording of the code starts a cumulative fault counter as well. In practice, the GEM will reactivate the circuit when there is no longer a demand for current on the affected circuit to allow the circuit to function, but if the fault persists, the fault counter will record each instance of the fault until a predefined number of faults is reached, at which point the GEM will deactivate the affected circuit until a definitive repair is carried out. On most applications, each FET-protected circuit has three predefined levels, or allowable number of faults, which levels are determined both by the harmful effects of various types of faults, and the durability of the FET-protected circuit to withstand those faults. Thus, if the total allowable number of faults for a particular circuit is say, 300 fault events, the 3 levels would be 100, 200, and 300 recorded fault events. Therefore, be aware that when each level of faults is reached, the code that was stored on the first event in that level can NOT be cleared by a command to clear all the faults that pertain to that particular event. The only way to clear continuous fault codes is to perform a repair that the self diagnostic function recognizes as a repair; put in another way, the GEM will perform continuous self-diagnostic tests, and only restore power to the affected circuit when it recognizes that a repair has been performed. Only when this happens will the code be cleared automatically, and full functionality of the affected circuit restored. NOTE #1: Some Ford Ranger trucks without the premium options package built after 4/2/1998 at the Edison and/or Louisville assembly plants may be fitted with GEM modules instead of CTM (Central Timer Modules). This may erroneously produce codes B1302 and B1398 – “Driver Power Window One Touch Window Relay Circuit Failure” when performing diagnostic testing. Note that these codes are NOT actually present on affected vehicles- refer to the relevant technical manual for the correct procedures when dealing with erroneous trouble codes. NOTE #2: Since code B1302 refers to faults in circuits that control the delayed power relay(s), the site of the trouble is unlikely to be between the affected relay and the accessory controlled by that relay. The fault is far more likely to be between the control switch that ultimately controls the affected accessory, or between the GEM and the affected relay. WARNING: Apart from the fact that diagnosing code B1302 requires above average diagnostic skills, having access to a complete wiring diagram for the application being worked on is an absolute requirement. Also obtain pin-out charts for the relevant circuits to prevent accidental short circuits by inadvertently touching the wrong pin(s) in a connector with a probe or bridging wire. If you are not comfortable using complex wiring diagrams, the better option is to refer the vehicle for professional diagnosis and repair. NOTE: Diagnostic and repair procedures for code B1302 are mostly make and model specific; therefore, this guide cannot provide specific procedures for all makes and models, although the guiding principles below should suffice to find and repair most causes of code B1302. Record all trouble codes present, as well as all available freeze frame data. Refer to the special notes above if codes do not clear. To save hours of diagnostic time, start the diagnostic procedure by inspecting all bulbs if lighting circuits are affected. Poor contacts and bulbs that are on the point of failing can create high resistances, which can set code B1302. Replace all suspect bulbs and bulb holders before proceeding with the diagnostic procedure, and retest the system to see if replacing bulbs and/or bulb holders had resolved the problem. Examine all relevant fuses for signs of overheating, blown filaments, or other damage. Bear in mind though that fuses do NOT need to be blown to interrupt a current flow, but merely inspecting fuses is not enough. Properly test all circuits with an approved circuit tester or a high quality digital multimeter to ensure that the circuit is functional. Consult the manual on the correct procedure (KOER/KOEO), to activate circuits and to establish ground connections where grounds are supplied by the controller. Replace all suspect fuses, and inspect fuse holders for signs of poor contact. Clean or replace fuse holders, and activate the affected circuit to see if functionality is restored. NOTE: In some cases, several drive cycles may need to be completed before power to some delayed accessory circuits can be restored. Consult the manual on the correct procedure to remove the affected control switch, and perform a thorough visual inspection of all associated wiring between the switch and the GEM. Look for damaged, burnt, disconnected, or corroded wiring and connectors. Make repairs as required. If no visible damage is found between the switch and the GEM, inspect all associated wiring between the GEM and the affected relay. Look for damaged, burnt, disconnected, or corroded wiring and connectors. Make repairs as required. NOTE: Pay particular attention to the crimped ends of all wires, since most wiring failures occur as the result of poor terminations. The typical result of poor crimping is a discoloration, and/or hardening of the wire insulation at the crimping point. Make repairs as required. Note though that although failures of splice joints in wiring harnesses are relatively rare, some applications are notorious for the poor quality of their splice joints. Be prepared to remove insulation from one or more harnesses to inspect/repair/replace splice joints. If no visible damage is found, consult the both the manual and the wiring diagram to determine the location, function, color-coding, and routing of all associated wiring. Perform resistance, ground, and continuity tests on all wiring in the circuit, and compare obtained readings with the values stated in the manual. Make sure the circuit is disconnected from the controller to prevent damage to the controller during resistance and continuity tests. Also, bear in mind that switches, sensors, and relays form part of the circuit, and as such, these components must be tested as well. Consult the manual on the correct procedures to test all switches, sensors, relays, and other related components. Replace all components that do not test within the manufacturers specifications, and retest the system to see if any codes return. If the code(s) persist despite having completed several drive cycles after repairs are completed, suspect a defective GEM, which is a very common failure on many Ford products. In nine cases out of every ten, replacing a GEM on a Ford product will resolve the problem, but the same cannot be said for most other applications. On most other applications the cause of code B1302 is as likely to be a defective GEM as it is to be an intermittent wiring fault or an erratic failure in a control switch, so do not assume that the GEM is defective if codes persist despite several repair attempts. Be aware that intermittent faults in wiring and switches can be extremely challenging and time consuming to find and repair, and in most cases, intermittent faults may have to be allowed to worsen before an accurate diagnosis and definitive repair can be made. None found. Ask a question about B1302.